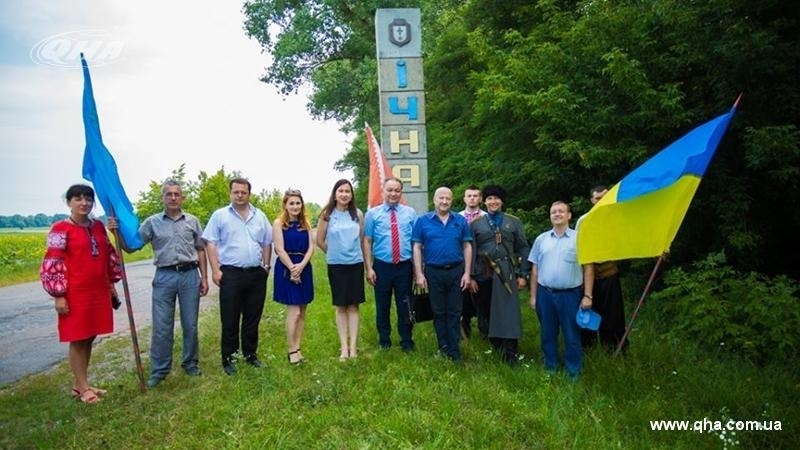 On July 26, a memorial stone, symbolizing the fraternity relations between Crimean Tatar and Ukrainian peoples and a strong connection of their history, was set in Krupichpole village in Chernihiv region. The delegation of members of the Mejlis of the Crimean Tatar people, Ukrainian and Crimean Tatar scientists visited several settlements of the Ichnia district in Chernihov region and took part in ceremonial events, dedicated to the setting of a memorial stone in honor of the events of 1659. Ukrainian and Crimean Tatar troops met and united before the Konotop Battle exactly there, in the area of the Krupichpole village. The delegation included the members of the Mejlis of the Crimean Tatar People: Director of the Charity Organization “Crimea” Foundation Riza Shevkiev, Director of the QHA Information Agency Gayana Yuksel, Chairman of the Crimean Tatar Resource Center Eskender Bariev, Crimean Tatar historian Gulnara Abdullaeva, Ukrainian historian Andrei Ivanets and others. Kyiv delegation was met with three flags – Crimean Tatar, Ukrainian and Cossack flags – at the approach to the city. Ukrainian Cossack, the Head of the Local Cossack Community and of the “Sokol Hutir” Mykola Cherep greeted the guests. He comes from ancient Zapoorozhsky and Kubansky Cossack families. The words about ancient relations of different but very close Ukrainian and Crimean Tatar people sounded. “As descendants and representatives of the Crimean Khanate army that fought here, we honor the memory of our people and come here to continue the tradition of friendship (with the Ukrainian people.) - Ed.). Crimean Tatars and Ukrainians had to be together. The time will come when the Crimean Tatar people increase and grow stronger, and we will continue to be worthy allies," Riza Shevkiev said. Kyiv delegation made the first stop in the Ichnia Administration, where the Head of the Ichnia District Administration Grygoriy Gerasimenko met the guests. The Head of the Administration briefly acquainted the audience with the history and modernity of the town, its features and potential in various spheres of life. Grygoriy Gerasimenko also told one of the legends about the name of the Ichnia town. The origin of this word is not known reliably, but, according to many historical data, the local river was called Ichen, which is translated from Turkic as "watering hole". It is assumed, that a comfortable Tatars settlement, covered with a forest, and a watering hole for horses were located in this area. The town retained the original name, only slightly transformed it to Ichnia, and the river eventually got the name of Ichenka. At the conference in the art school local activists told about the culture of the Crimean Tatar people and about the close relationship of Ukrainians and Crimean Tatars throughout long common history. The event was organized for the Ichnia residents, representatives of the local authorities and public organizations. Many people came to the event and they showed the interest to the life of the Crimean Tatar people. During this conference, representatives of the Mejlis told the audience about the current situation in the occupied Crimea, violations of human rights, persecution and judicial cases of Crimean Tatars and Ukrainians. “Our history is full of worthy examples and bright images, cultural and spiritual heritage. There were alliances, brotherhood and support in this history. Konotop battle is a bright example of it… Those historical events are repeated now and we must unite and be together again. And we will be able to withstand some external threats only in this way," Gayana Yuksel noted, recalling the events of 2014, when Russia annexed the Crimean peninsula. The visit of the members of the Medjlis of Crimean Tatar People and historians to the Ichniansky district continued with solemn opening ceremony of the monument, devoted to the unity and solidarity of the Ukrainian and Crimean Tatar people, in Krupichpole village. The monument is of great historical significance. The meeting between two powerful armies – the troops of the Ukrainian Prince Ivan Vygovsky and the Crimean Tatar Khan Mohammed Girey IV Sofu – was held on the place of Krupichpole village in July 1659. Strong Ukrainian-Crimean Tatar military alliance went from here to the legendary Konotop battle, where two peoples fought against the Moscow aggressor. The project of laying a memorial stone was initiated and implemented by local activists and the Mejlis of the Crimean Tatar People with the support of the Ichniansky district leadership. This stone is the first monument in the mainland Ukraine dedicated to the soldiers of the Crimean Khanate and their Ukrainian allies. The residents of a small Ukrainian settlement took part in the opening ceremony of the memorial stone and pleased the Kyiv guests with folk songs. The The Head of the Village Council Vasili Petrovich Mysa stressed in his speech the importance of this event for both peoples . “This place should be Mecca for every Ukrainian and Crimean Tatar ... We have the right to our common future. Even today we are going through difficult trials, but we will win”, Eskender Bariev said. Setting of the memorable stone in Krupichpole village is the first step to a correct assessment of the history, Gayana Yuksel stated at the opening ceremony. The cultural program for Kyiv delegation was shown after the official part of the event. In particular, upon the invitation of the Chernihiv Cossack Nikolai Cherep, the guests visited the recreation complex “Sokol Hutir” (“Falcon Farm"), the embodiment of Ukrainian national color against the backdrop of picturesque nature. Horse show, a generous Ukrainian dinner, friendly speeches and smiles finished the one-day visit of the Kyiv delegation to the Ichnia district of the Chernihiv region.